Who would have thought one of the Wii’s most engrossing games of recent months would totally forgo any motion controls and be a 2D side-scrolling RPG slash-em-up? That’s right; you can sit and play this Wii game all afternoon without worrying about waking up the next day feeling that familiar tightness in every muscle. Well, your thumbs might take a slight pounding, but nothing the little brutes can’t handle. So dust off the pad for this one folks. 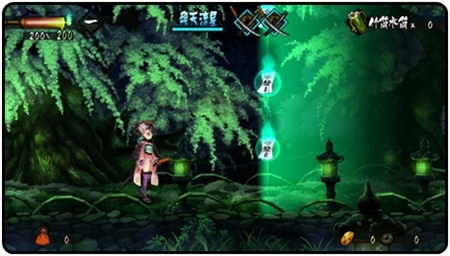 The game plays across 2D screens of ancient Japan with the art-style done in a hand-drawn and cell shaded style to fantastic effect. Everything’s brilliantly smooth and a fine example of how to make a retro-styled game without blocky sprite animation. 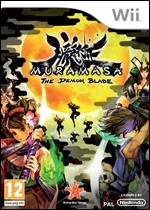 If you ever played Odin Sphere on the PS2 but felt it was too little, too late (not to mention too damn hard), think of Muramasa: The Demon Blade as the game you hoped Odin Sphere would be. 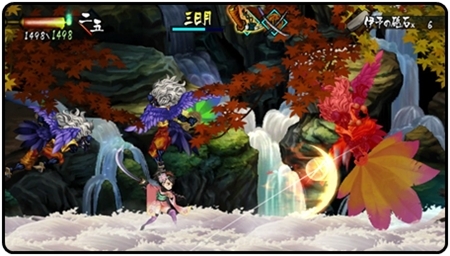 You run and jump across the short scrolling screens, that if empty of enemies can be ran through in under ten seconds. 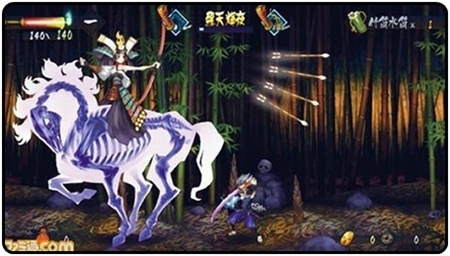 There are lots of screens though and many with multiple tiers such as the balconies of a Feudal Japan-style building or the inside of a cave or over the top of it through a forest. Some areas will have a door or a bridge for you to move up or down to another screen too. This is all easy to follow with a map that you can have over the screen while you play, highlighting colour barriers, treasure and entrances to challenge caves. The combat is deceptively simple, mainly using the A button and pushes and holds of the analogue stick for a mix of quick, charged, darting, jumping and uppercut attacks. Combinations of these can attack multiple foes at once, juggling them into the air to do some serious damage and chain dozens of hits. Enemies are pretty standard for the game’s setting, including: ninjas, huge armoured samurai, giant centipedes, moody Ronin, cave goblins, giant toads and my personal favourite, bomb-throwing-ninja-attached-to-giant-kite. You can only attack when enemies are nearby which makes early practice against thin air a no-go. The tutorial only lets you practice a move briefly before quickly ushering you onto the next one, making it slightly difficult to keep track of them all at first. Before long though, there are plenty of enemies for you to practice on. You can equip three swords at once to switch between mid-fight and you can carry many more in your inventory. You don’t have to dump any so mixing things up is actively encouraged. Before you start to think ‘is that it?’ for your attacks, you’re introduced to the Secret Arts. Each sword has a unique move activated with Y, such as a swirling cyclone, fireballs, pillars of fire or a spinning Catherine Wheel of steely death that you can set down to watch your back. After a few chained hits, you’ll be able to activate the Quick Draw by swapping between weapons and unleashing an attack that batters everyone on-screen at once. Along with a damage rating, some swords also have a status effect or stat boost. No two swords are the same. A little tactical thinking is required as fighting will wear down your sword’s Soul Power and cause it to break, meaning you’ll have to change to another while it self-repairs in the background. A broken sword can do minor damage but is unable to block. The recharge times start off fairly forgiving but around four hours in they can become challenging during boss fights when you’re waiting for all three to fix themselves and you’re basically trying to take down a giant demon horse with a sword handle. New swords can be forged from the pause menu with Souls and Spirits. Souls are picked up around a level or from defeated foes while Spirits are gained from eating food pick-ups that also top-up your health. You can’t just buy any sword though; it has to be from a choice of the next in line from a long list like a family tree of long, standard and short swords. Defeating bosses will also grant you the odd blade too. 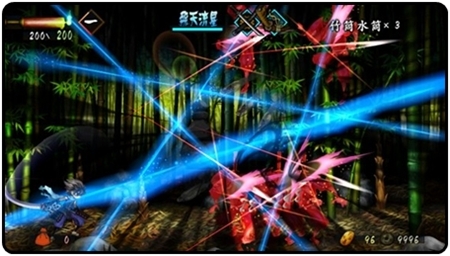 Some swords are essential for progression to certain areas as they have an ability to destroy coloured barriers blocking the way. So you might have to buy a few weak ones to get the one you want on the tree. It can be a little annoying having to eat some of your food to get a Spirit boost too, especially when you don’t need the extra health at the time. What about the story? Well to be honest it’s weak to non-existent and barely worth a mention (memory loss, powerful sword, imminent war etc), but you do get a choice between a male and female character who have some unique weapons, routes and bosses. The other main criticism of the game is that the objectives are basically the same with them generally being kill everything and get a sword that unlocks a coloured barrier somewhere else. The level’s visual design and variety is top notch though. If you don’t mind the action being a bit on the repetitive side, the gameplay is consistently enjoyable and compelling with a constant drive to unlock new swords (there’s over 100) and to go back to previously locked areas. This is a long game too; you won’t appreciate how much of an adventure you’re in for until you see the world map screen for the first time. The well animated 2D visuals add to the game’s charms and play to the Wii’s strengths by avoiding any blurry 3D visuals making this worth a look for any action-RPG fans on the little white box. Hmmmm I wouldn’t say bonirg. More like it doesn’t fit the flashy complex games of today. The game? highlights where you need to go and you fight and explore a lot. But the game play is solid, I was shocked some press agencies called it repetitive most FPS games are yet they never say that! Infact they say its revolutionary or ground breaking. 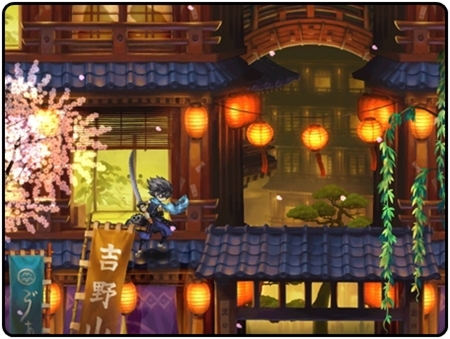 However Demon Blade has a very old school vibe to it and the gameplay alone makes it worth its price tag.